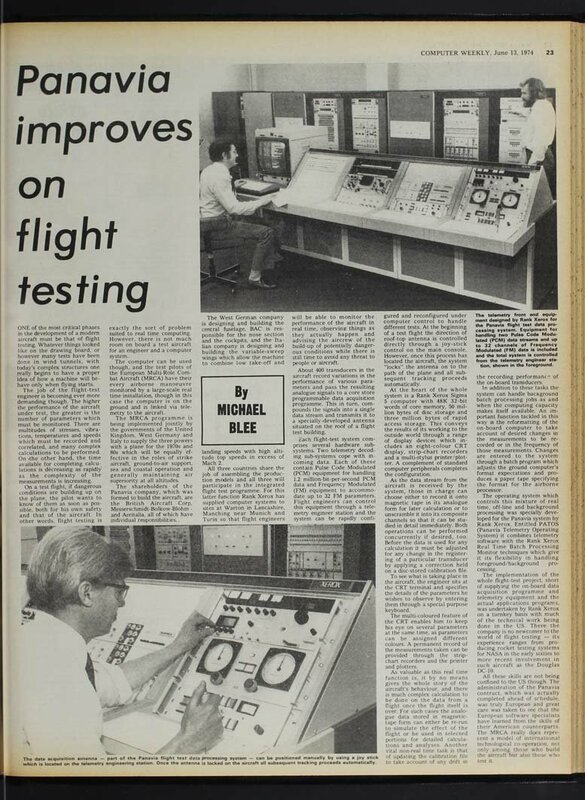 One of the most critical phases in the development of modern aircraft must be that of flight testing. However, there is not much room on board a test aircraft for an engineer and a computer system. Test pilots of the European Multi Role Combat Aircraft have their every airborne manoeuvre monitored by a large scale real time system, linked via telemetry to the aircraft. About 400 transducers in the aircraft record variations in performance of various parameters and pass the resulting analogue signals to a core store programmable data acquisition program. At the heart of the system is a Rank Xerox Sigma 5 computer with 48K 32-bit words of core memory, 50 million bytes of disc storage and three million bytes of rapid access storage.